It’s a dreamy number, really…#1. Sometimes readings can be so much fun, and I must say, reading for the Healdsburg Literary Guild ended too quickly. Here’s a lesson…watch your time. After reading from Cancer Time Bomb and losing track of time while chatting about writing, I began reading an excerpt from another book I’ve been writing (for too long). The crowd was attentive and appeared immersed in the story, but just when it was getting to a really juicy part, my time was up. Twenty minutes goes by so quickly! It was nice to hear some genuinely sad ahs from the audience when I had to stop, and I especially enjoyed the reaction to one of my descriptions. I heard that quiet “wow” from the audience that gives you goosebumps and drives you to continue honing your writer’s voice. I must thank my friend Ann Carranza, a writer for the Press Democrat, who offered such a wonderful and personal introduction. The accolades she listed reminded me how I love going after a difficult story (as a reporter), and helped me remember why I should continue to write…even on those days when, aside from door shelves lined with condiments, my refrigerator displays only yellow light glowing through the glass shelves within. The dreadful light accentuates the recesses of the cold box as result of an astounding absence of food. Mustard sandwich anyone? Buy my books! It was nice catching up with Gabe, a colleague from past newspapers. And it was a little sad leaving the town that once captured my daily attention. A small town tucked away in Sonoma County’s wine country, Healdsburg always served as that mystical place in my daily existence. Many changes have transformed the downtown into a thriving tourist attraction for wine enthusiasts, but I’m hopeful it maintains that small-town feeling. Years ago, when I would drive north every morning to work at the Healdsburg Tribune, I would feel a twinge of excitement as I crossed over the river and drove into town. Many mornings, thick fog would blanket the bridge, protecting the town like it was Brigadoon until a path cleared and drew me through town. And the summer air…there was something magical and soothing about the air on warm summer nights. There are these quiet parts of town that are so still, it seemed like another world; something out of the fictional Mayberry. If you visit one of those many peaceful areas of Healdsburg during the summer, I invite you to stand still, close your eyes, quiet your mind and breathe deeply. You will feel like a child enjoying a carefree day you hope will never end. Thanks again to the Healdsburg Literary Guild! 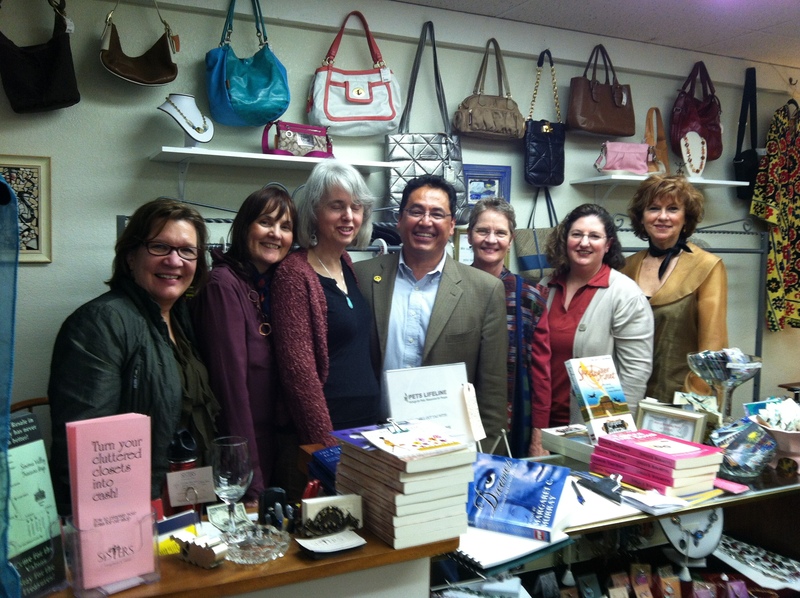 I was a featured author at a “Sisters” reading event held in Sonoma Friday evening. I had a chance to read an excerpt from my next book; one that I have been editing for too long (began writing it nearly a decade ago). I chose to read about the night my sister died, but I wasn’t the only writer focused on death and depressing subjects. Based on the subject matter (one mom’s suicide leaves children behind; a dad beats the crap out of his family, then returns home the next day so his wife can cook his breakfast; death, disease, cancer…) events like this one confirm that all writers are screwed up. Before we began the readings, it was nice to find out from another writer, she had seen my book reviewed in the Bohemian. Ah, so that’s why I had the sudden spike in sales. That was a nice surprise. I am grateful to the Sonoma County Library system for inviting me to speak about Cancer Time Bomb. Last month, I was at the Central Sonoma County Library in Santa Rosa, this month I was at the Petaluma branch, and next month in the new year, I’ll be at the Northwest Santa Rosa branch. 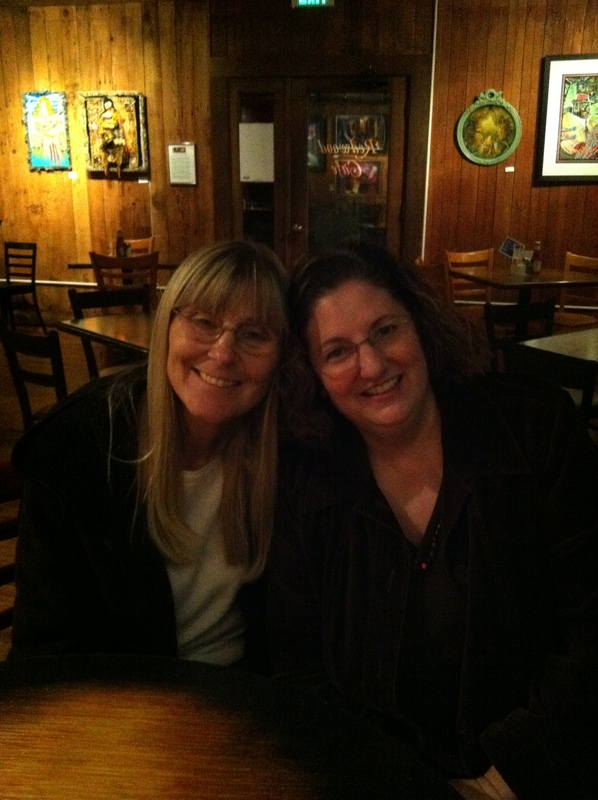 In Petaluma, I met a very nice woman, Dianna. I nearly fell over when she said she was turning age 70 next year. Before she mentioned her age, she had been talking about her grandchildren and I was thinking how she must have been a very young mother. She only looked like she was in her early 50s, at most. Such a beautiful woman on the surface, but more importantly, she had a kind spirit. Moreover, I never know how people are going to react to the amount of profanity in Cancer Time Bomb. But after supplying ample warning, how delightful it was when she reacted with understanding and agreed that there are times in your life when the F-bomb is the best expression of emotions, thereafter adding how it feels good to say F*^%. Yes, I have found my sister spirit. It was a pleasure meeting Dianna, and I hope she enjoys the book. And, of course, thanks to my hubby for handling book sales for the afternoon. Before we left town, we stopped by the Copperfield’s to see how many copies remained of my Hanukkah book. They’ve been selling out at local stores and I wanted to stop by to see how they were doing in Petaluma. They only had two copies left in the Hanukkah book display. Woo hoo! “Yes. I wrote it.” I don’t think she believed me. 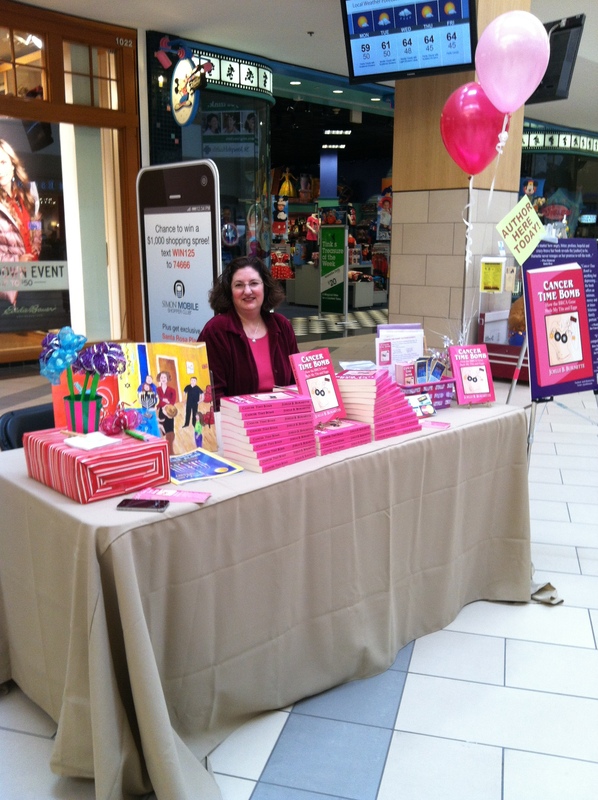 Yes, sorry, another book table photo, but hey…this one is in a mall! I really wanted to hang out in the Disney Store (in the background). Many thanks to Kim H. at the Santa Rosa Plaza shopping mall for hosting the “Paint the Mall Pink” event that helped raise awareness of breast cancer. My wonderful hubby stayed with me throughout the day. It was the first time the mall had the event, and they plan on having an expanded event next year during Breast Cancer Awareness Month in October. 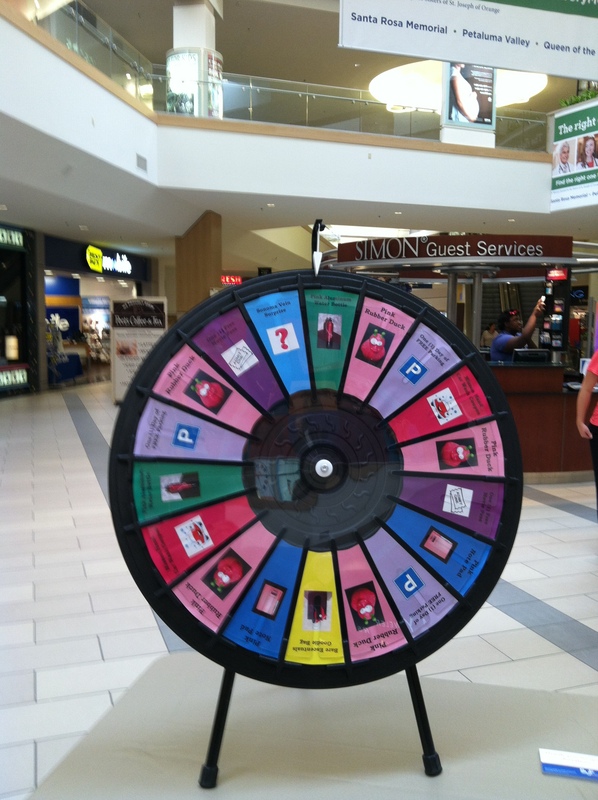 Oh, and the mall had a wheel for people to spin and win prizes…there were a lot of happy winners. Oddly enough, my table faced a booth that featured some kind of laser treatment to reduce red lines on your skin. I know that because I got to watch a video all day. I had that and the mall television above my head repeating the same promos every few minutes for several hours…that’s enough to make you go a little nuts. Did you spin the wheel? What did you win? I had delightful conversations with several shoppers. It was especially nice to have a woman and her daughter stop by to tell me how she had seen my Cancer Time Bomb bookmark at one of the local Copperfield’s Books. She purchased the book and wanted me to know that she really enjoyed reading it. Yay! I guess those bookmarks really do work! Woohoo! One last note. How is it I always manage to attract a particular kind of person…the kind that insists everything cancer-related is associated with diet. “If you just change your diet, you’ll avoid cancer,” is what they say. I agree their message is true…up to a point. For years, my sister has been a healthy eater and was a dedicated exerciser. She was at her healthiest when she got breast cancer the first time. And while she was a healthy eater before her cancer, she became even more diligent about her eating habits, including insisting on organic foods; she won’t even use a microwave oven. And as much pain as her body experiences on a daily basis, she continued to exercise. Then, little more than a decade later…kaboom! Cancer struck again. So, sometimes, diet doesn’t change things because your genes are screwed; there’s not a lot you can do about it (except, eh-hem, cut everything off/out…read my book!). It was an eventful day today. First, the interview about my book aired three times on KRCB radio (visit my In The News page to listen to that interview). Many thanks to Danielle Venton and KRCB! Then in the evening, I had a reading at the Dine with Authors event at Redwood Cafe in Cotati. There was a nice crowd and interesting books. It was great to see some of my local chums at the event. We shared good conversation and a tasty meal leading up to the readings. 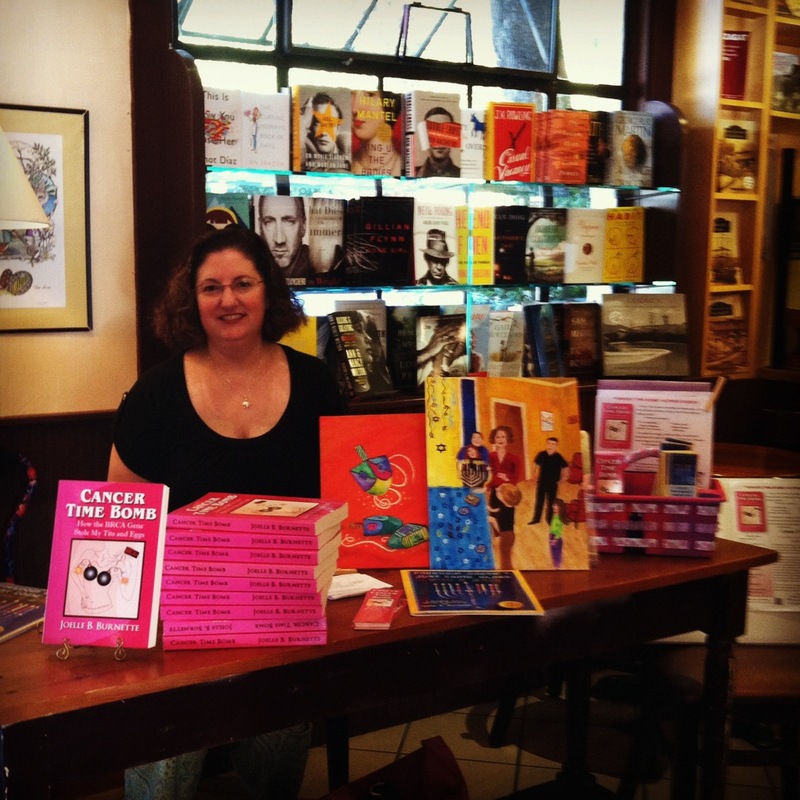 I read from “Cancer Time Bomb” and introduced my Hanukkah book, and four other authors read from their books, as well. Okay, so I think I found the super-secret thing on the menu…the soup and salad combo was a lot of food, and Mark was jealous. Speaking of my hubby…he doesn’t usually get to go to my readings, but he has the week off from work, so he got to come along. I read a section of the book that is about him and my dad. What a beautiful Marin day it was on Tuesday at the Depot Bookstore in downtown Mill Valley. 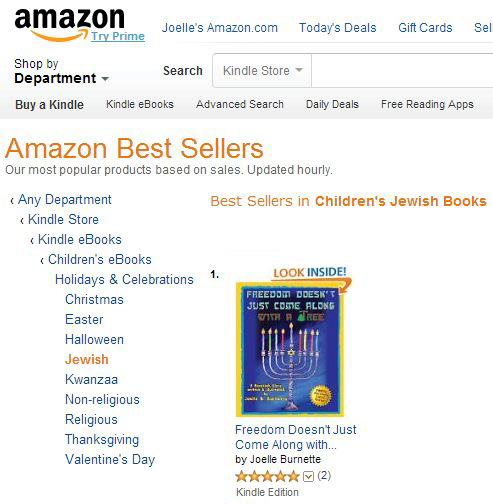 It was nice chatting with people about Cancer Time Bomb and showing my new Hanukkah book that is now selling in print at Amazon. And speaking of my Hanukkah book…A happy coincidence was finding out that the store’s very kind book buyer Pamela is related to the person who wrote the Christmas poem; I based the opening stanza of my holiday story on that poem. I’m glad to say, this great-great-great-etc.-granddaughter of this famous poet said she enjoyed my book. She was enthusiastic about carrying it in the Depot Bookstore, so check it out soon. Also, it was fun chatting with a local man who worked as a crime reporter for the Chronicle for several decades. When I started writing on newspapers, crime reporting was one of my beats…and a lot of fun, I might add. That may sound crazy, but I loved covering police and fire stories; racing out the door to chase down the story. I hope his daughter enjoys the book. Happy birthday, Adrienne! First, I must apologize for causing people to cry while reading from my book at the conference. I chose to read about the moments right after I found out about my BRCA status–an intense time. Most everyone in the audience responded that they are BRCA-positive, so I was surrounded by people who are closely invested in the process we have all traveled. It was great to have some physicians at the conference; I think it’s important they understand the emotional aspects of what patients go through when they find out they are BRCA-positive. I’m thankful to have met so many women who are facing their own BRCA and cancer challenges. It was nice to meet people who have already purchased my book and brought it to the conference to have it signed. It’s one of those little OCD things that bothers me…not knowing who has purchased Cancer Time Bomb. I want to thank them for buying my book! If you attended the conference, I hope you found some answers to questions. I hope I answered your questions, and I’m glad I was able to ask my own questions with the medical panel. Thank you to Genetic Counselor Alex Yonkers at California Pacific Medical Center (BRCA Connections), and FORCE for teaming up to offer this great event. 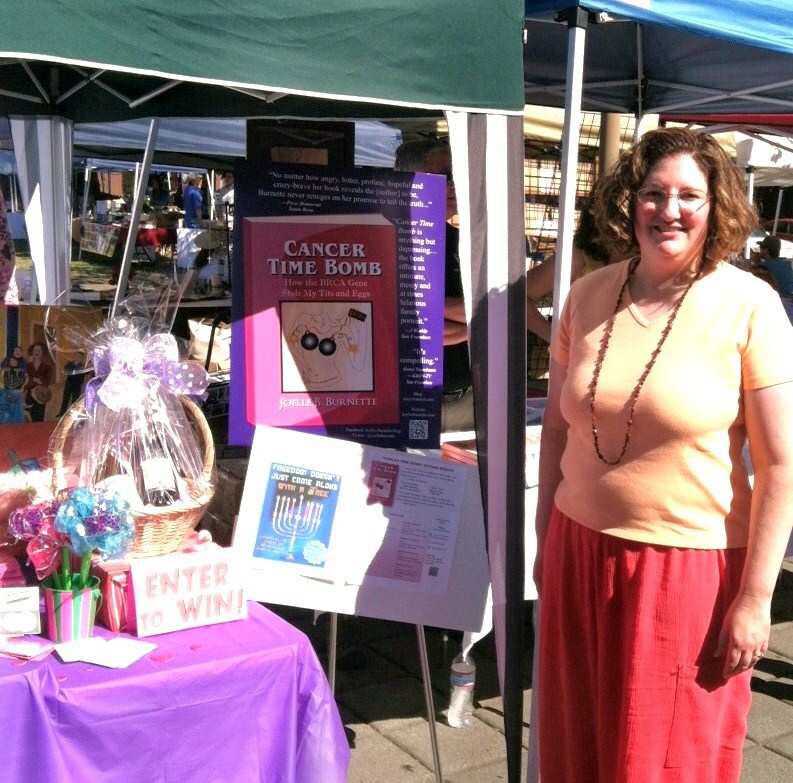 It was fun meeting so many people at Saturday’s Sonoma County Book Festival in Santa Rosa. I met people who have read my blog (which I’m afraid I’ve been neglecting lately), some who know me on Facebook, and more friends who have already read Cancer Time Bomb and offered positive reviews. If you signed up to win the wine basket at the book festival, here’s the moment you’ve been waiting for…Congrats to Celia J. from Santa Rosa who is now enjoying two bottles of delicious wines from Dry Creek Vineyard!